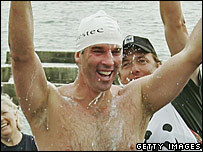 An environmental campaigner has become the first person to swim the length of the River Thames. Lewis Gordon Pugh, 36, a lawyer who wants to draw attention to a campaign by conservation group WWF on climate change, finished at Southend, Essex. His 203-mile journey began in Kemble, Gloucestershire, on 17 July. "This challenge has proved far more difficult than I expected due to the drought and the heatwave," Mr Pugh said on Sunday. "It has been a long time. I am absolutely exhausted. It has been an incredible journey," he added. "I never thought it would be this hard. It is certainly the hardest swim I have ever done." The endurance swimmer is concerned about the effects of climate change in the polar regions and in the UK and has also swum in Arctic and Antarctic waters. The feat began at the source of the Thames, where the water is only a trickle. Mr Pugh ran the first 19 miles before diving into the river at Lechlade. Every day, he swam the equivalent distance of half of the English Channel. The journey has taken him through Oxford, Reading and London, before heading out to the Essex coast and Southend-on-Sea. 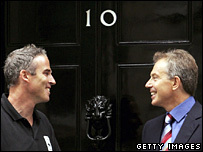 On Thursday he made a pit-stop at Westminster to meet Tony Blair and discuss problems for the environment. He said the prime minister had told him he was "proud" of his effort. "I just hope that my swim has brought home the message that we have to do all we can to tackle climate change," Mr Pugh said. Geraldine Marsh, WWF Regional Campaigner, said: "We are really proud to support this heroic first that will highlight the impact that climate change is having on the world. "What we do in the UK has a direct effect on the Arctic and Antarctic regions." The organisation wants the government to meet its target to reduce CO2 emissions by 20% by 2010.